ItemI-57629 - Tatlatui Lake from Mount Tatlatui. ItemI-57625 - Sustut Mountains from Mount Eyrie across valley of McConnell Creek trail; see i-57624 to i-57628. ItemI-57269 - White Eye Jack, Lena and Klootch. ItemI-57270 - Two young women and their babies; one of them Chief Louis' daughter; Cold Camp, Bella Coola Trail. ItemI-57271 - Moose Dixon fording the Bonaparte. ItemI-57272 - Johnny Currie, "half-breed Pemberton". ItemI-57463 - Parle Pas rapids from the right bank; see i-57462 to i-57464. ItemI-57523 - Little Parle Pas Rapids, from the south side. 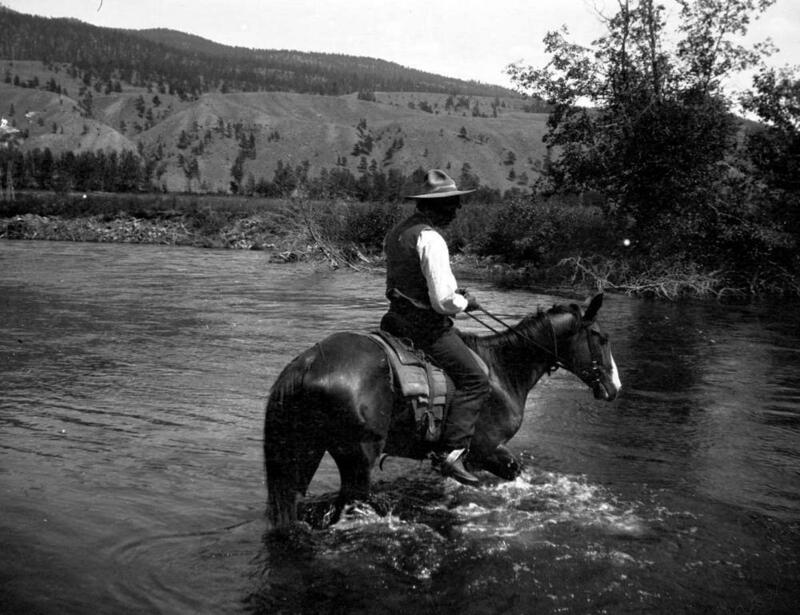 Item I-57271 - Moose Dixon fording the Bonaparte.